Eccentric Alonso Quijano is passionately enthusiastic about tales of medieval knights and their fantastic adventures: slaying giants, fighting evil wizards, rescuing maidens and chivalrous knights saving the day. Slipping into a state of mind where the lines between reality and fantasy start to blur, he takes on the persona of Don Quixote de la Mancha and sets off with his loyal servant, Sancho Panza, to rid La Mancha’s towns and villages of giants, villains and injustice in a world where windmills become giants, inns become castles and madcap adventures abound. While he ignores all of Sancho’s sage advice, his friends create ever-increasingly frantic ruses to lure him back to his bed, attempting to cure him of his apparent insanity! I strongly suspect that I am not the only person to instantly recognise the name of Don Quixote but who had very little pre-knowledge of the story, character or the play (possibly the reason why this was a small audience on opening night). Director Rubin Sanchez-Garcia’s programme notes inform us that – as Shakespeare’s plays are to British students – Miguel de Cervantes’ novel of Quixote’s adventures is a well-known school text for Spanish pupils, but that – unlike Shakespeare’s plays, which are written to be performed not read – Cervantes’ novels are not written for the stage and that “any theatre adaptation faces enormous challenges”. This is a challenge that Maskers’ Theatre Company accepts, takes on and achieves with great style. 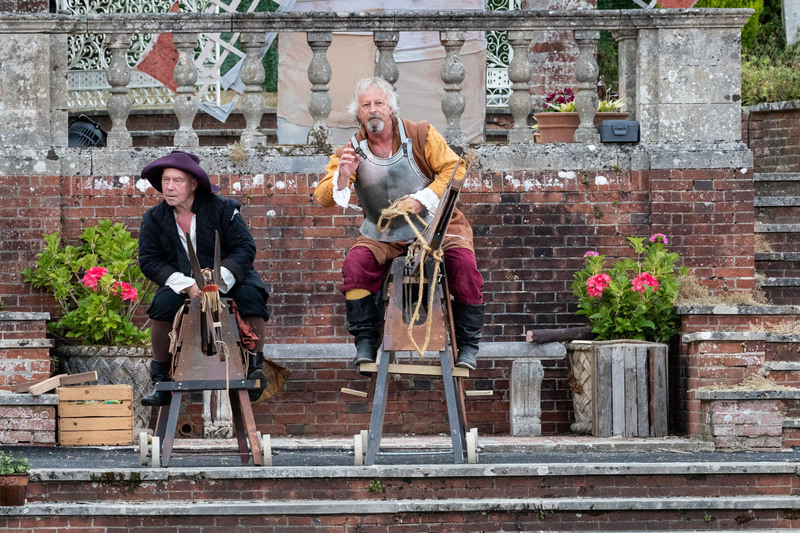 Neil Quinlan, no stranger to the stage but here making his debut for Maskers, gives a strong performance as Quixote, encompassing senility, madness, bravado and passion in equal measures. Colin Russell is excellent in his comic timing, intonation and asides to the audience as Quixote’s humorous, wry and faithful servant, Sancho; despite all his prudent wisdom being completely ignored by Quixote, he is eager to have adventures abroad (with governorship of his own island his promised reward) rather than stay at home and be hen-pecked by his domineering wife, Teresa. Kate Grundy-Garcia is splendid as Teresa: feisty and powerful, definitely the one who wears the trousers in the relationship! Quinlan and Russell make a convincing duo and embrace the physicality of their characters’ adventures with enthusiasm as they throw themselves into slapstick fights. This is a real ensemble production, with only Quinlan and Russell portraying one character apiece. 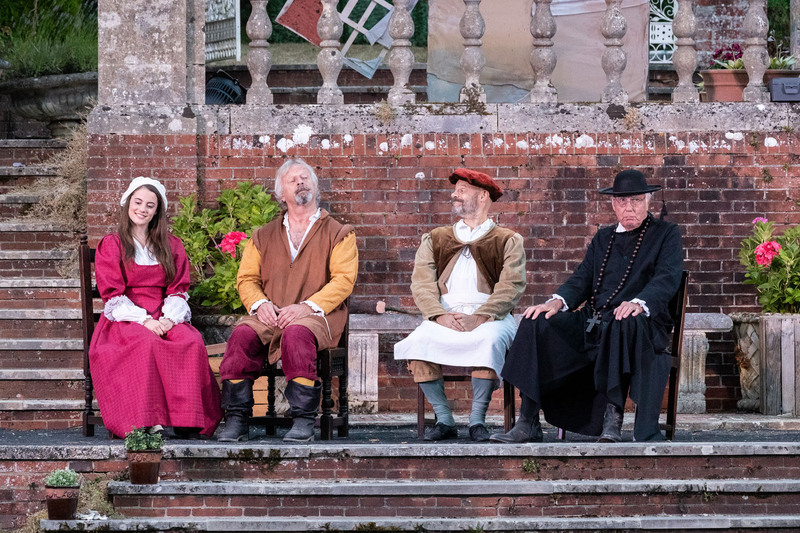 The rest of the cast take on multiple roles, each distinctive and credible in their individual characters, with Adam Taussik (named as Don Diego), Angela Stansbridge (named as Maritornes), Alan Watson’s Curate and Millie Grundy (Quixote’s niece) being particularly memorable. 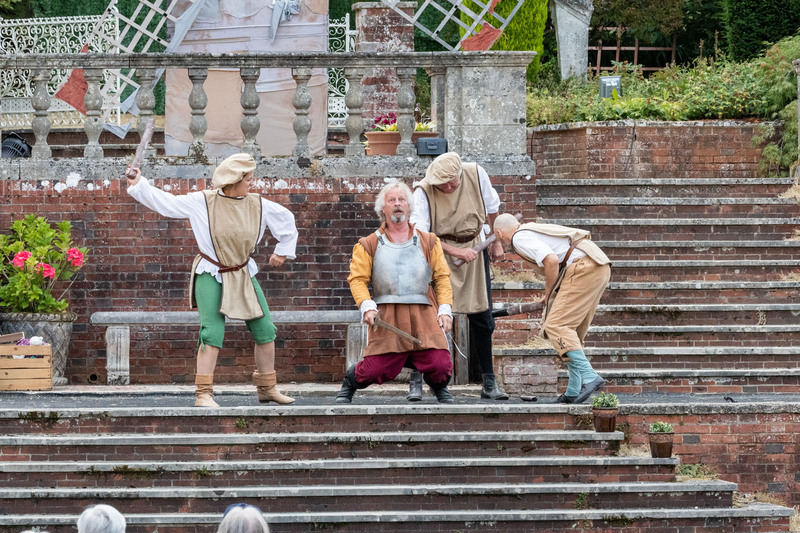 The entire company gels together very well, and Sanchez-Garcia makes great use of the different levels of Hamptworth’s beautiful garden setting to stage, with equally skilled direction of comedy and pathos, the fantastic adventures of Don Quixote. The costumes are a terrific reflection of 16th century Spain, enhanced by excellent props and set dressing. 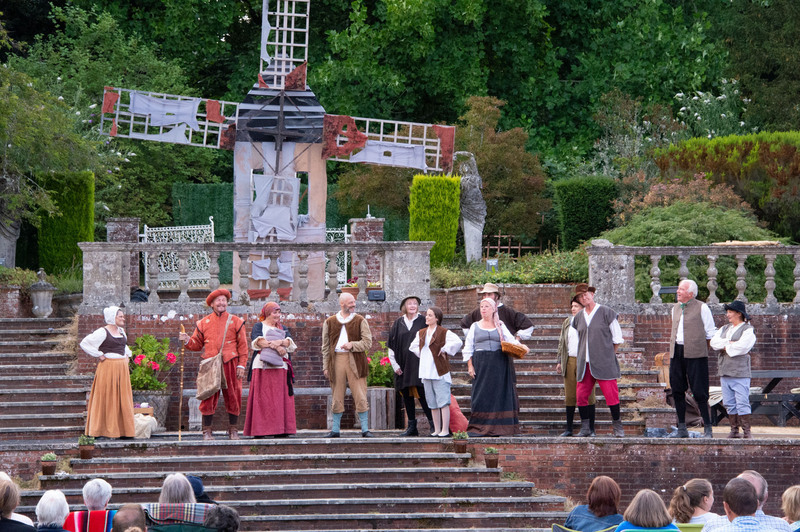 The set itself, except for a moving windmill, is minimal but when the venue itself provides such a perfect setting for this production, any additional scenery would be superfluous. 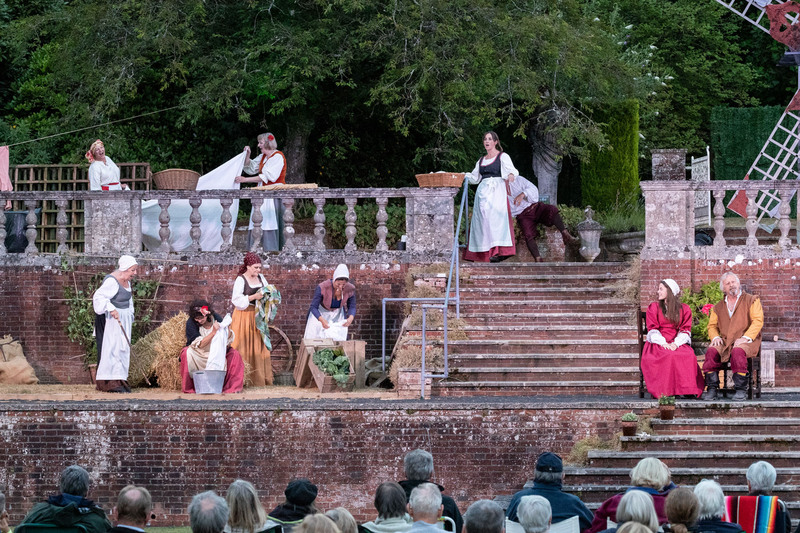 It is difficult to light an outdoor production with any subtlety when the days are long and natural daylight persists into the night, but Clive Weeks succeeds in Act 2 to bring impressively atmospheric lighting effects to the scenes as dusk falls. Sound is rarely noticed during a production unless it goes badly, but here again Maskers are blessed with the skills of sound designer Jamie McCarthy; the sound effects are excellent, perfectly balanced, location-specific and impeccably timed, mics amplify the voices to reflect the cast’s excellent diction and projection, and the combination of pre-recorded and live music adds the ideal final touch to the production. There may have been some moments on opening night where the pace became a little stilted and lines seemed a tad laboured, but I am confident that this will flow more naturally and smoothly as the cast gain in confidence and momentum. 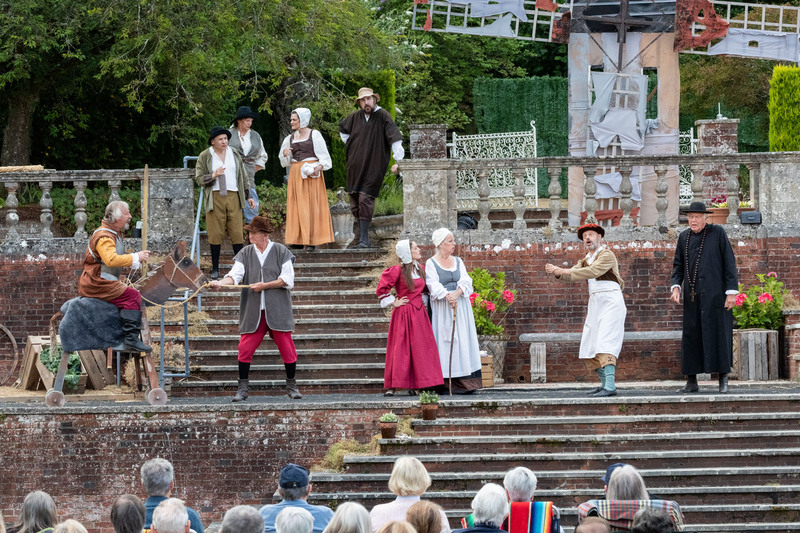 I have attended numerous summer outdoor performances by Maskers over the years and this was the smallest audience that I have seen in recent memory; that is such a shame, as this is a very entertaining production and fully deserves to have much larger audiences. 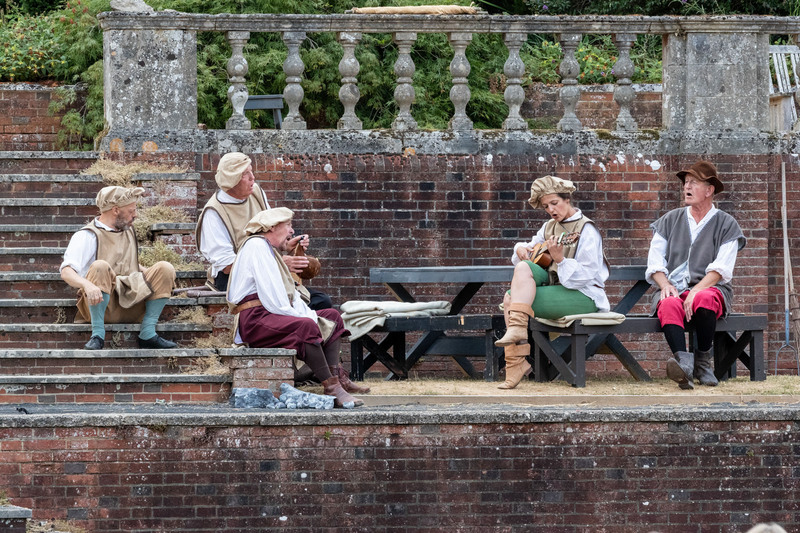 With the wonderful setting of Hamptworth Lodge, warm summer evenings and even the parched lawns bringing a touch of Spain to the usually green Hampshire countryside, this is a great way to relax and be entertained by a very talented group of performers. 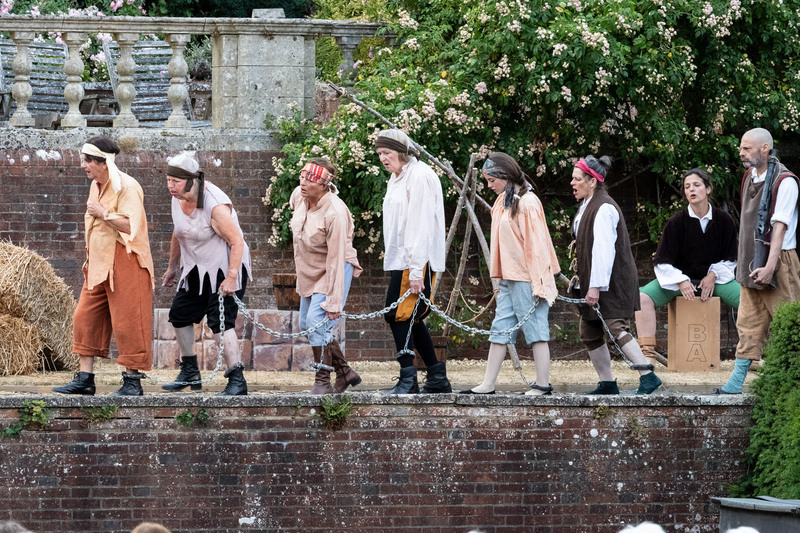 This wasn’t my first trip to the beautiful Hamptworth Lodge to see the Maskers Theatre Company perform one of their outdoor productions, but it was certainly the warmest. I arrived, placed my chair and made the most of the obligatory picnic, including a bowlful of strawberries and cream before the show started. The music struck out, recorded birds began to sing and the show began in earnest. At first the loud birdsong somewhat drowned out the speeches, but within minutes the wildlife quietened down and from then on every word was perfectly received throughout the archery lawn where the show was staged. The story teller comes on to relate the tale of Knight Errant (or should that be an errant knight? ), Don Quixote, roping in the local Spanish peasants to help act out parts (which they did superbly). The original book by Miguel de Cervantes was published in two parts in 1605 and 1615 and is the most influential piece of literature in the Spanish language, but was never intended for the stage. Keith Dewhurst kept the play as near to the novel as possible while selecting passages from here and there to turn the piece into a wonderful comedy without losing any effect, spectacle and storyline. Neil Quinlan’s portrayal of the mad Don Quixote is breathtaking. I have seen Quinlan take on many roles in the past and, although he has played them all well, he really excels here in a hard-to-top performance. Words, movement, expressions, those mad eyes of his have the audience rolling. He is funny throughout, while still able to bring many lumps to the audience’s upon his death at the end. Don Quixote’s sidekick, Sancho Panza, is played with equal aplomb by Colin Russell, another performer I have seen many times; very funny, especially when galloping on Dapple, his wooden donkey. At one point as Panza and Quixote gallop away (Panza on his donkey and Quixote on Rocinante his old barn horse) when Rocinante decides to topple over, throwing Quinlan off. However, the feet-first landing brought about a wonderful round of applause from the audience. Alan Watson’s curate is also very enjoyable to watch, scheming away even when he isn’t speaking. The curate doesn’t have an interest in the books and stories of his friend Quixote, but he enjoys his madness at all times. Jez Minns plays Nicholas the Barber among other roles. Nicholas is an old friend of Quixote who recognises his friend’s madness but only intervenes to help the curate carry out his plans. I liked the moment when Quixote steals the barber’s basin thinking it is the helmet of Moorish King, Mambrino. Adam Taussik as Don Diego, sounds like the French soldier from Monty Python’s Holy Grail, suiting the part perfectly. Kate Grundy-Garcia as Sancho Panza’s wife Teresa is accompanied by their five children whenever on (all full-sized puppets, bringing a smile to the faces of all in the audience). The whole show is excellently directed by Ruben Sanchez-Garcia with production help from Brian Stansbridge and Christine Baker. Sanchez-Garcia knows exactly what is wanted by the audience and succeeds brilliantly. John Hamon excels at designing the remarkable set complete with windmill, wooden horse and Panza’s wooden donkey. He makes good use of all available space with nothing hidden from view, no matter where you sit. 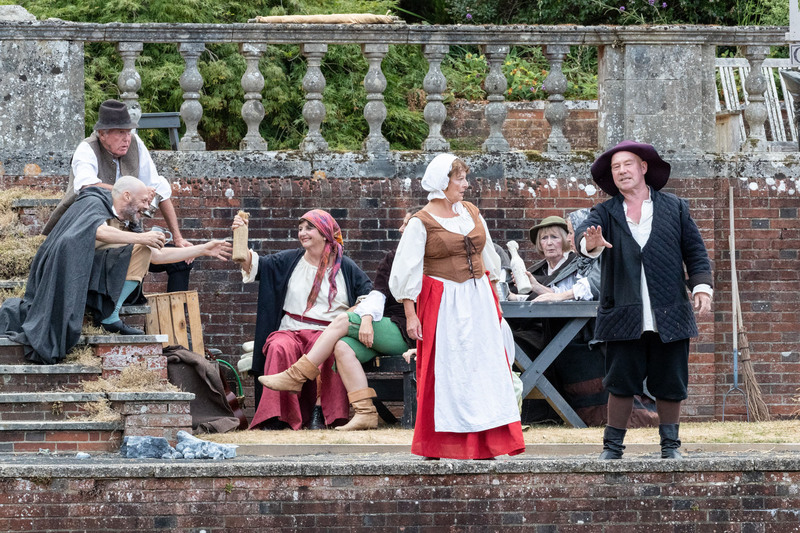 Lighting (Clive Weeks and his team of Paul Duell and Tom Foyle), which includes illuminating the setting of Hamptworth Lodge, gardens and pond as well as the stage and its key points, is nothing short of superb. Sound designer Jamie McCarthy, with Peter Court operating has also done a great job throughout without a word or sound effect being missed. The body-armour looks authentic, with Brian Stansbridge at the forge. The list goes on and on with everyone involved making this a top-class presentation. Everyone should be pleased and proud of the finished show. I am now looking forward to next year’s production. I wouldn’t miss it for the world. "Just a brief note to say how much we enjoyed your performance on Wednesday evening. The props, the costumes and the acting were all superb and the only disappointment was the poor turnout of the audience! It deserved a full house and we sincerely hope that audience figures have improved. Thanks again for a memorable evening." - B. and B. C.
"What a fantastic evening and wonderful location. Really enjoyed it and such great efforts; acting, scenery, lighting all great. Thank you" - C.C. "Just want to say we went as a family on Sunday and thoroughly enjoyed it. Possibly the best Hamptworth production we have been to yet ..." - P.C. "Don Quixote was an action-packed romp with a suprise around every corner. A thoroughly enjoyable evening!" - H.S. Come with us to Spain! This National Theatre adaptation provides moments of hilarity, fast-moving action, romance and pathos. A memorable piece of theatre ideal for Hamptworth's beautiful outdoor surroundings. Alonso Quijano is an ageing minor aristocrat obsessed with books of medieval knights and their fantastic adventures, slaying giants, fighting evil wizards, rescuing maidens, and acts of great chivalry. One day he launches himself into his fantasy (or is it his madness? ), takes the title “Don Quixote de la Mancha”, and sets off with his loyal servant and squire, Sancho Panza, a local farmer, to rid La Mancha's towns & villages of giants, villains and injustice. In Quixote’s feverish mind, windmills become giants, inns are mistaken for castles, and sheep turn into warring armies. Sancho’s down-to-earth advice and common sense are to no avail against his master’s fantasies as they ride from one mad adventure to the next. Meanwhile, back home, Quixote’s friends, anxious to cure his madness, are devising desperate schemes to bring him back to the safety of his own bed! Ruben joined Maskers in 2010 and has since appeared at Hamptworth as a pirate in Treasure Island, Oberon in A Midsummer Night’s Dream and, last year, as Passepartout in Around the World in 80 Days. Other acting credits include Soldier in Chair, Peter in Zoo Story and Andrey in Afterplay. Ruben directed Phyllis Nagy’s Butterfly Kiss at Maskers Studio Theatre in 2013. He is looking forward to directing his first open-air show and bringing this 17th century Spanish tale of love and delusion alive to our Hamptworth audience. Don Quixote marks Neil’s first production with the Maskers and he is looking forward to the challenge of the role. Quixote is a complex mixture of sanity and madness, with lashings of comedic personality and energetic movement. Neil started out in performance many years ago with Southern Theatre Productions, playing minor roles in many well-known musicals such as The Sound of Music, Carousel, and My Fair Lady. The past twenty-three years has seen him cast in many diverse roles with RAODS, such as Captain Oates (Terra Nova), Antonio (Much Ado About Nothing), Sergeant Troy (Far From The Madding Crowd), and Widow Twanky (Aladdin). 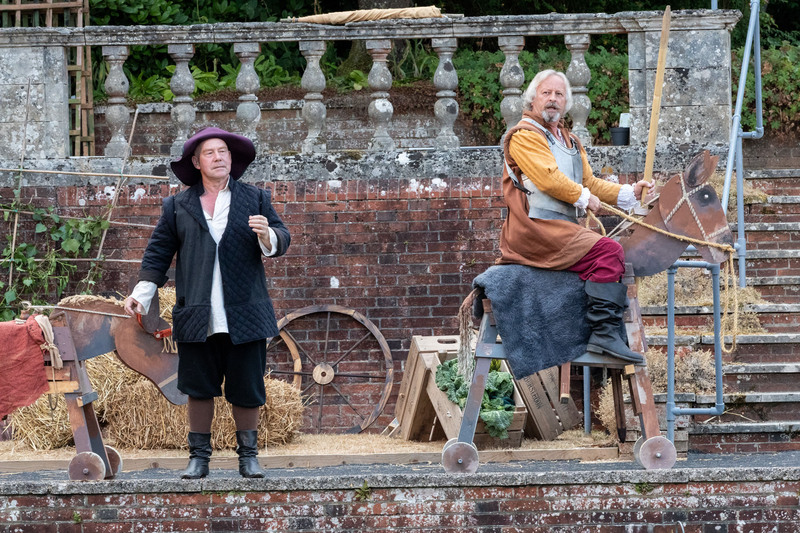 Over the years Colin has appeared in several open-air shows with other companies, including Canterbury Tales, Jack The Ripper, Cheshire Cats and Twelfth Night, but the setting at Hamptworth Lodge is obviously one of the most impressive. This is Colin’s second Maskers’ show, having last been on stage at The Berry Theatre in Wyrd Sisters. Bringing such a classic story to life has been an experience, and he knows you will enjoy the result. At the age of three, Jenni was bitten by the acting bug when she first performed in her local church nativity play! Over the years she has performed for Maskers, as well as other local groups, in a variety of settings. Her favourite roles include Vladimir (Waiting for Godot), Lady Booby (Joseph Andrews), Ellie Dunn (Heartbreak House), Lady Capulet (Romeo and Juliet), Paulina (Winters Tale), Red Queen (Alice), Nancy (Sitting Pretty), Mrs Pearce (Pygmalion), the Contessa (An Italian Straw Hat) and Angela (Vicars). Jenni is very much looking forward to playing the Housekeeper and many other parts in Don Quixote! Alan has been a Masker for forty years and has played in eighteen Open Air productions at Hamptworth and, previously, at Mottisfont. He is looking forward to a fortnight here in Spain with Don Quixote; saves the hassle of Gatwick! Jez is very happy to be coming back to Hamptworth this year - despite the terrible weather last year! He can’t think of anything to say that is witty and scintillating, but he has shaved his head for this show and grown a grey beard so, if you’re right at the back, you should still be able to spot him! Enjoy the rain, you crazy English!!!! Millie’s first show at Hamptworth was Treasure Island when she played ‘Minnie Captain Flint’, aged just 7. Since then she has played a monkey and a wolf in The Jungle Book and the ill-fated Wally in Our Town. She is now looking forward to playing Don Quixote’s niece, among other roles, in this epic Spanish Play. Don Quixote will be Paul’s 23rd open air show for Maskers. During that time he has played a variety of roles, including Weasel Norman in Wind In The Willows and Thomas Cromwell in Anne Boleyn. In last year’s Around The World in Eighty Days he played four parts; if you count puppets and impersonating a knight, he plays even more parts this time. Rumours that 2019’s show will be his one man show persist. Sue has been a regular in the Hamptworth cast playing various maids, monkeys, fairies and a selection of characters in last year’s Around the World in 80 Days. She was nominated for a Curtain Call Award 2016 for best supporting actress for her role as Mrs Samsa in Metamorphosis. This year, she is again playing multiple roles of both sexes! Angie has been a member of Maskers since 1973 and has enjoyed playing a wide range of parts, most recently in Room at the Inn, Ten Times Table and, at Hamptworth, Comedy of Errors, A Midsummer Night’s Dream, Treasure Island and The Importance of Being Earnest. She is often to be found working on the finishing touches of set dressing and helping with wardrobe and props. As a member of the hardworking marketing team she is rarely seen without a bundle of publicity flyers and posters!! She is enjoying playing multiple parts in Don Quixote. Brian has been a member of Maskers for far longer than he cares to remember and has been involved in many shows, both as an actor and a director. Recent acting credits include the Station Master in our 2016 Christmas production, Mistletoe Junction, Long John Silver in Treasure Island, plus taking over a major part in Ten Times Table at the Nuffield Theatre, at nine hours’ notice, when the actor playing the part was stricken with laryngitis. Recent directing credits include Mistletoe Junction, Room at the Inn, The Importance of Being Earnest, The Servant of Two Masters and The Comedy of Errors. Since joining Maskers 15 years ago, Adam (a committed pacifist) has played a few officers and servants (usually of the lower ranks), ending up as Colonel Stamp Proctor in last year’s Around the World in 80 Days. For this show, Adam will also be renewing the international character of the last few years and channelling the spirit of globalisation into the myriad Spaniards seen here (but don't expect the Spanish Inquisition). When not in the 17th Century, he has another life in Student Services at the University of Southampton. Hazel is delighted to be returning to the beautiful grounds of Hamptworth Lodge with Don Quixote. As the play has developed in rehearsal, she has been interested to learn its history and that some of Shakespeare’s ideas may have been taken from Cervantes. Hazel has been a member of Maskers for many years; her special interests have drawn her to directing, set design and, of course, performance. Hazel plays several roles in this production, chiefly the Duchess, which gives her an opportunity to wear a pretty dress. This is a pleasant change from her last role as a bearded Welshman in Wyrd Sisters! Roland has been with Maskers for just about 18 months. He is coming back to acting after over 30 years and was last seen as Basil Fawlty in Fawlty Towers in his earlier Surrey roots. Roland is very much looking forward to being in this summer’s production of Don Quixote as The Duke, a character who shares a similar wicked sense of humour. Heather has only recently joined Maskers and is thrilled to be involved in the summer production at Hamptworth. She has been happily retired for several years, pursuing her interests in music and travel, but fulfilled a latent yearning for the stage when she became part of the community company of migrants in The Grapes of Wrath at the Nuffield. 'One of the grapes', as she says, with pride! Carolina joined The Maskers last year. She recently enjoyed appearing in a Nuffield show, The Shadow Factory, as a member of the chorus. Now in Don Quixote, she has only one line to say, despite being the only Spanish person in the cast! However, she is enjoying playing the Spanish songs. She hopes you all have a great time! Kate has been a Masker for over 25 years and has acted in the open air on a number of occasions. She recently played Ismene in Antigone but is now enjoying being part of a family show with her daughters, Millie and Isla, and husband, Ruben. ...and what a bunch of 'actors' they are! TICKETS AVAILABLE ON THE GATE - all performances! Still not got your ticket? They are available on the gate at all performances. CASH OR CHEQUES ONLY PLEASE (no signal for card reader). A cashpoint is available at the garage in Landford. Patrons are welcome to picnic in the beautiful gardens of Hamptworth Lodge from 6.00pm (1.30pm on Sunday 22 July). You are advised to bring low back chairs, rugs, etc., as NO SEATING IS PROVIDED. We suggest you also bring jumpers or coats, as it can get cold even on the warmest of evenings. Click on an image to view it.